Because data is saved differently and the integration methods vary in each accounting package, if you are planning to or have switched accounting systems, then you should be aware of how that effects your Calxa data. First of all please refer to the FAQ, What accounting software works with Calxa? to confirm your new accounting system is supported. If it is supported, then this help note will guide you in migrating your existing data. If you have any difficulties remember that our Customer Support team is only an email or phone call away, or our Accredited Partners can help with onsite assistance. Create a new organisation in Calxa by connecting to your new accounting software. Once you have created the new organisation you should now see two companies listed in your organisation list: one from the old package and one from the new package. Note they may have the same organisation name but the accounting software logos are shown in the list (example below). You will need to open your existing organisation and repeat the export steps below for each of your budget versions. Select Export comments enabled and Export detail accounts only. Click Export and Save the file with a name you can easily recognise later. Use the new organisation that has been created from the new accounting software and export the budget as per the steps above. You will now have an exported budget from the existing (original) organisation and the new organisation. Open both budgets in Excel and copy the account number column and account name column from the new organisation into the existing (original) organisation budget. Note that the account rows may not be in the same order in each of the budgets, so it may not be possible to do a copy and paste of all rows in one go. Select the new organisation (new accounting software). In the Budget versions column expand the Edit Budget Version section. 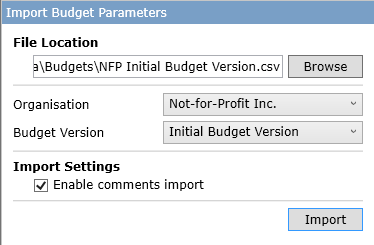 Type the name of your new budget version in the Budget Name field and click Add. Select the new accounting software Organisation. 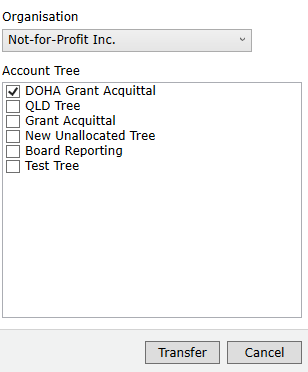 If you had created custom Account Trees in your existing organisation then you will need to copy them to the new organisation, otherwise you may skip this step. Repeat the steps below for each Account Tree. Select the drop down menu as part of the Create New icon. Following is a list of settings that cannot be copied or imported and must be setup manually. The links will take you to associated help notes.